Made with finely ground potatoes for a smooth texture every time. CONTINENTAL Mashed Potato, made with finely ground potatoes for a smooth texture every time. Finely ground real potatoes for creamy smoothness everytime. 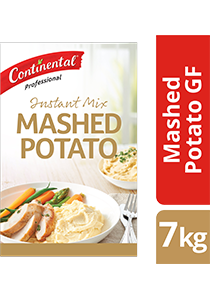 CONTINENTAL Professional Gluten Free Instant Mashed Potato Mix is made from real potatoes to create a rich and creamy mashed potato. Bring the required quantity of water to boil. Turn off heat, sprinkle in CONTINENTAL Professional Gluten Free Instant Mashed Potato Mix & whisk until smooth. Serve or keep warm in a bain marie. Note: Add less water to create a firmer mash or extra water if a smoother mash is required. Weight 7 kg. Dry mix wt serving/portion 17 g.
To keep fresh, seal foil bag tightly. Store in a cool, dry place.